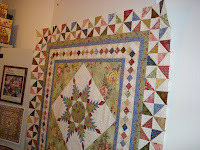 The pinwheel border is on! Yes, its Saturday morning and I am going to spend the day in my sewing room. I'm working on the 2009 BOM from The Quilt Show. So far I am keeping up with the work. 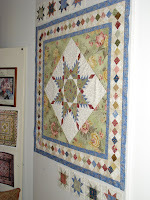 March blocks are pinwheels and more stars. I hope to finish them today. I love this quilt. I have to come see it in person. BEAUTIFUL!! Your quilts are so pretty! Can you make me one?